CIBO Trattoria – $68 per person for a 4-course dinner. You can also order this menu a la carte. Crowbar – $200 per couple for 32 oz organic dry-aged ribeye steak cooked to order, served alongside freshly baked bread, feature pasta and two sides, all capped off by a sinfully decadent dessert. Only 14 sets available. Did you know WildTale’s Dine Out menu is only $30 this year? When my family and I went there for Dine Out last year it was $40! I was invited to a preview of this year’s menu and I was curious to see how it has changed. Turns out there are a couple repeating items on the menu, which makes this $30 menu a pretty good deal. One of the repeating items is the WildTale Seafood Chowder. Well, it’s not entirely the same as last year’s, but the idea is there. The chowder was the most memorable appetizer last year, and this year’s chowder was my favourite appetizer on the menu. 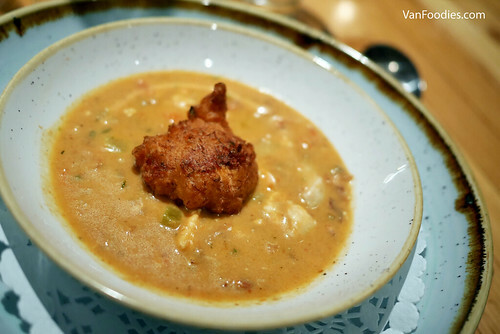 It was rich, creamy, flavourful – and the corn and crab fritter was nice and crispy, adding some texture to the soup. WildTale is owned by the same company behind the three Flying Pig restaurants, which have solid reputation of consistent, quality food. Since its opening last year, I’ve been to WildTale three times. First, I took my bridesmaids there after the wedding last summer, as a thank-you for their help; then, my family and I went there for Dine Out just this past January (a table of 8!). And now, I was invited by the restaurant to try some of its menu items. It’s hard to believe it’s taken three visits before a blog post about this restaurant. They say three times a charm?! 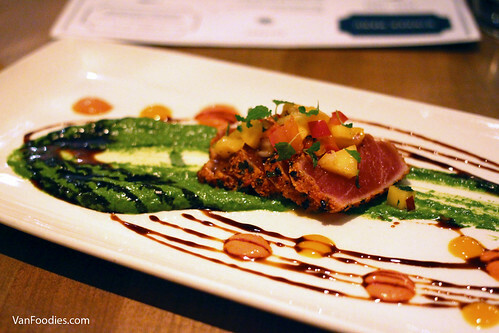 This modified Seared Togarashi-Crusted Ahi Tuna was a great start to the dinner. I actually had the regular version last summer with my bridesmaids. The major different between this and the regular version was the mango & herb puree and the sweet soy reduction drizzle. The puree added some herbaceous freshness to the dish, while the sweet soy reduction provided a nice sweetness (kind of like an elevated teriyaki sauce). This was the only plate that was a modified version of a regular menu item. Ahi tuna tends to be on the milder side when it comes to flavour, so the togarashi spice crust gave it some heat, and it was balanced nicely with the sweet mango salsa. This was a very tropical plate. As suggested by the name, the Salmon Trio included three preparations of salmon – cured, tartare, and smoked nugget.